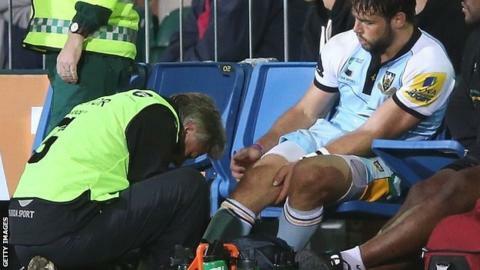 England full-back Ben Foden will miss the autumn internationals after being told he needs surgery on an ankle ligament injury. The 27-year-old was hurt while playing for Northampton Saints against Bath. We have a number of back three players who are playing well and this offers a chance for them"
He will have surgery in the next few days and is then likely to be out for 10 to 12 weeks. England face Fiji at Twickenham on 10 November, followed by games against southern hemisphere giants Australia, South Africa and New Zealand. England have options for the number 15 shirt with Mike Brown and Alex Goode both having filled the role during the summer tour to South Africa. Head coach Stuart Lancaster said: "It is unfortunate for Ben who has had a good run in the side and is a valuable leader. "But we have a number of back three players who are playing well and this offers a chance for them. "Our medics will work closely with Northampton Saints to help Ben's recovery and I am sure he will be available for the RBS 6 Nations." Northampton boss Jim Mallinder said: "Ben had been playing well at the start of this season and to lose him to injury is obviously disappointing. "But we know that he is a dedicated professional and will work his hardest with our performance team to come back as a better and fitter player."